SALT LAKE CITY, Utah – HARMAN’s DigiTech is kicking off its October e-pedal introductions with the debut of its Vanishing Point Modulated Delay for the iStomp downloadable stompbox. Vanishing Point gives guitarists the sound of high-end rack delays that lightly modulate the sound of the repeats after they delay – along with a host of additional sonic possibilitites. The Vanishing Point Modulated Delay can add shimmer to clean chordal work or a touch of animation to overdriven guitar solos. Vanishing Point can provide up to two seconds of true stereo delay, and its Tap Tempo feature enables the musician to tap the footswitch to sync the delay speed with the tempo of the music. Vanishing Point offers controls for Delay (delay time), Repeats (number of repeats), Mod (degree of modulation) and Level (effect level). The DigiTech iStomp is an entirely new concept in guitar stompboxes that allows musicians to turn the iStomp into any pedal in the Stomp Shop online pedal store. Offering almost limitless sonic possibilities, the iStomp connects to an Apple iOS device where musicians can use the Stomp Shop app to load it with the e-pedal of their choice. The Stomp Shop is a free app and comes with two of the most popular requested pedals, the DigiTech Total Recall Delay™ and the DigiTech Redline Overdrive™. It gives access to 39 additional pedals that musicians can browse, try out and purchase, with more pedals added every month. 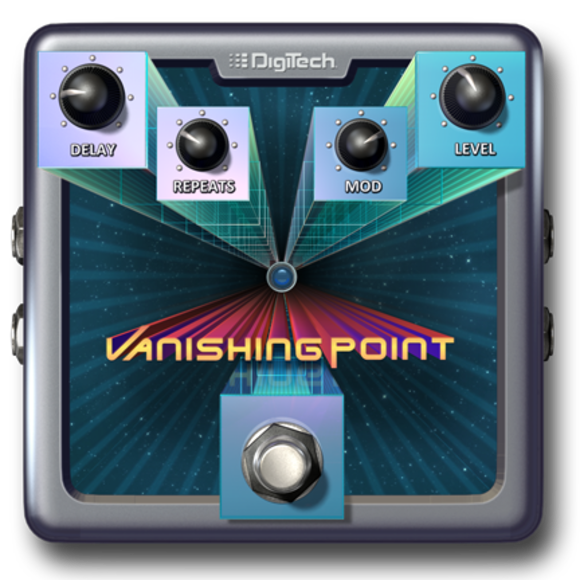 The DigiTech Vanishing Point Modulated Delay e-pedal will be available in October 2012 at an introductory price of $0.99. This introductory price will run through October 31, 2012. After the introductory period the price will change to $9.99.